How should you resign from your job when it’s time to move on to something else? There are certain things you shouldn't do when you turn in your resignation. There are good - and not so good - ways to resign, but it’s best to keep a cool head and not burn your bridges. Quitting a job can be a volatile time. For example, an angry employee may quit by leaving a note on a manager's desk saying he or she quit and won’t be back. Another employee could get mad, yell at the boss, and walk out the door. Neither option, of course, is the best way to resign if you can help it. Leaving on a positive, rather than a negative, note will give you a better chance of getting a good employment reference if needed later. 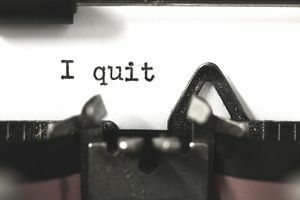 The employee who resigns gracefully, gives two weeks notice, writes a polite resignation letter, and thanks the employer for the opportunities they had during their tenure at the company will be appreciated even though he or she is moving on. You want to quit. So, take a deep breath and plan ahead. Here's what you should (and what you shouldn't) do when resigning from your job. Do Clean Up Your Computer. Even if you give notice, your employer may decide that you should be done right now, and you may be shown the door. Before you turn in your resignation, clean up your computer. Delete personal files and email messages, but make sure you have the contact information for everyone you need to keep in touch with after you're gone. Don't Put Anything in Writing. Regardless of how much you hate your job, hate your boss, or hate the company, don't say it. Ever. Even if quitting is the best career move you've made up to this point, keep it to yourself. It’s best to be careful with your words, so here's what to say when you quit your job. Also, review what not to say when you resign. Your resignation letter will be placed in your employment file, and it can come back to haunt you - even years after you have resigned. It honestly isn't worth venting. If you've got issues at work, it's more appropriate to deal with them before you leave. Do Give Notice When Possible. Unless the situation is untenable, giving two weeks notice is standard practice when resigning. There are some reasons when you could quit without notice, such as if you’ve been endangered or sexually harassed. But if those reasons don’t fit your current situation and you want to leave sooner, it's appropriate to ask if you can leave right away. Get the Details. When you tell your boss or Human Resources Department that you're leaving be sure to get the details on the employee benefits and salary you’re entitled to have when you leave. Inquire about continuing health insurance coverage through COBRA (Consolidated Omnibus Budget Reconciliation Act) or through the government's Health Insurance Marketplace, collecting unused vacation and sick pay, and keeping, cashing in, or rolling over your 401(k) or another pension plan. Don't Be Negative. When talking about your resignation with co-workers, try to emphasize the positive and talk about how the company has benefited you, even though it's time to move on. There's no point in being negative - you're leaving, and you want to leave on good terms. Don't Brag About Your New Job. Even if you just got the best job in the world, don't brag about it. Is there really any point in making your soon-to-be ex-colleagues feel badly that you're leaving? They'll miss you, and you've got a great job to go to so don’t boast about it. Do Offer to Help. If it's feasible, offer to help during the transition and afterwards. The offer may not be accepted, but it will be appreciated. Do Ask for a Reference. Ask your boss and colleagues if they would be willing to give you a reference. If they agree, ask them to write you a LinkedIn recommendation as well as being available via email or phone. You'll have the reference as part of your LinkedIn profile, which is great for your future job search endeavors. Don't Forget to Say Goodbye. Before you leave, take the time to send a farewell message to co-workers and to let them know that you are moving on to a new position, starting a job search, retiring, or doing something else with your life. It's appropriate to send an email farewell message. Include your contact information, so that you can stay in touch. Here's more on how to say farewell to colleagues. Do Write a Resignation Letter. It's a good idea to write a formal resignation letter for your employment file, even if you resign via email or on the phone. You don't need to say much more than you're leaving and when your last day of work will be. If you're not sure what to say, review these resignation letter samples for just about every resignation scenario you can think of - from formal, to heartfelt, to relocation, returning to school, and other personal resignation situations. Or, take a look at the following sample resignation letter, sent by email, for inspiration. I'm writing today to let you know that I am resigning from my position as Marketing Coordinator at ABC Company. My last day will be in two weeks, on Friday, September 15. I'm grateful for all of your support and training during my three years at ABC Company, as well as your friendship. You've made each day brighter. I've learned so much thanks to you and everyone else on the marketing team. Please let me know how I can help during this transitional period. At the end of the month, I'll be starting a new position as Marketing Manager at XYZ Company, but you can always get in touch if questions come up. My personal email is omar.robinson@email.com and my phone number is (555) 555-5555. Thank you again. It's truly been a pleasure working with you, and I wish you and everyone at ABC Company all the best.